Democrats are flaming liberals, Republicans are rich conservatives! Ugh, does this exhaust anyone else besides me? Everyone has opinions, but why do we so oppose each other and try to get everyone not on our side of the opinion war to convert to our views? Last Sunday I watched an open forum conducted by Saddleback Church pastor Rick Warren (see the story for yourself). It was an unbiased forum that asked each candidate similar and sometimes identical questions. What I liked most about this forum was that it was not a democratic or republican funded event; it was a man who loves Jesus asking questions to both sides. What I realized after the program is that my opinion is very screwed up and influenced by others. I like a lot of what Obama is about, but most of it is because I hear how much hope he can bring from the democratic party and poverty stricken people I love so much. The reason I originally didn’t like or care for McCain was because he was a republican who only cared about the rich and was an idiot, at least this is what I was told by others. After watching the forum I realized that I was able to get clear answers on important questions I have and for once able to have my own opinion of each candidate. The problem with all this political stuff is it is not fair. I was telling a friend the other day about something and how I was reading fox news and she said, “I hate fox news!” I thought this was peculiar because hate is a strong word especially when aimed at a news station. So I asked why and she just said, “Because…well…they’re…” Oh, I see where this is going now I think to myself and offer to finish her sentence….”because they are conservative and thus republican?” I had some friends tell me the same thing about cnn as well. “Don’t watch that liberal crap, read real news and go to fox news!” Really? I’m just a little confused by all this. I was talking with a friend at the gym last night and telling him how I felt about this very thing and my reaction to the forum and he says, “Oh you just don’t want to vote for a black man.” He said it in jest but behind that is the very thin I cam getting at here. Behind our opinions is a deep resentment toward the opposing side. Why must we bash the republicans or democrats? Warren asked pointed questions to both candidates and I was surprised by McCain’s on point answers without hesitation. I was also surprised by Obama’s slippery way of dancing around several questions and never really giving an answer. I saw it as playing to a side or trying to win votes, trying to market himself more so he didn’t answer certain things. So I was shocked to realize that all these opinions I hear and have been fed are really not great. It was good for me to see for myself what each man thought about issues or how they answered questions. So what I am saying is that we are all influenced by a ton of opinions that aren’t necessarily healthy and we should research for ourselves what each man thinks about specific things we are concerned with, not whether or not he is a democrat or republican. Don’t just go out and vote for Obama because you are a middle class African American voter, nor vote for McCain because you are a Bush supporter and republican to the core. 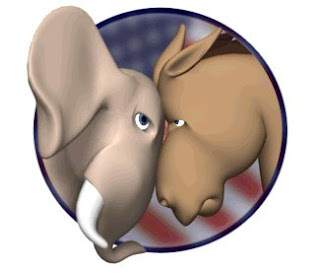 Vote based upon your own opinion of how each candidate views specific issues that concern you. America is divided by this crap and it really makes me mad. So come on people, before you take strong Obama or McCain stance, think, research, consider for yourself, don’t just accept a media or majority opinion for your own, don’t adopt another view, have your own. I wish there were more forums like the one Warren hosted so more American’s could get answers to questions without all the fluff and persuasion. P.S. Just a side note, I’m not into politics, my allegiance is with Christ and I don’t think he’d be a democrat or republican. So this article is truly written by someone who could care less about republicans or democrats, thus neither party being capitalized in this writing at all. Nice job, Adam. We'll be featuring your post shortly at IndyChristian.TV shortly.